It's been so long since I last wrote about travels. What I write now is all about a glimpse of life. I realise that hahaha but sometimes you can't force yourself to do something you're not ready to do. In this case, I don't want to update you guys about it just because I feel I'm responsible and tied to this. I don't want to feel like I'm forced to do something. In other means, I'm not as busy as it seems but I do get busy. Being in engineering school is tiring. So shout outs to those who made it!!!!! Enough about that, to those of you who follows my instagram or twitter, you guys know where I've been to this year. So right after I finished my second semester, I went to Sarawak, South Korea, Vietnam and Langkawi Island. Here's the tricky part, Sarawak wasn't in my plan like at all. I mean not during when I was bound for Korea because I once said to my friend that I would follow her some time back to her hometown. Then, it turned out my finals examination finished a week early before my departure to Seoul. I wanted to go back to Kedah but unfortunately my dad didn't allow me to do so as it would be ridiculous because I need to come back to KL. Then, I decided to go to Sarawak and permission granted. So yeay! Anyway, I don't want to bore you with so much details. Roughly, I plan to check some national parks but unfortunately, some were closed due to heavy-and-constant rain. I stayed there for like 8 days and most of the time all I did was eating. I blame you Sarawak for making me eat so much it's so ridiculous hahaaha and for being the benchmark of me gaining so much weight. So one day, we went to Muzium Etnologi. I've been here before anyways during my first ever visit to Sarawak which was back in 2005. I was 8 lol. After some time at the museum, we walked to Plaza Merdeka. I tried Mee Kolok at its food court and I was very disappointed haha. Then, we walked some more. This is actually a cafe if I'm not mistaken. I barely remember lol. This mural was at India Street. Definitely a check-out! This mural is only a few steps from the Orang Utan mural. The next day, we only stayed home and eat. 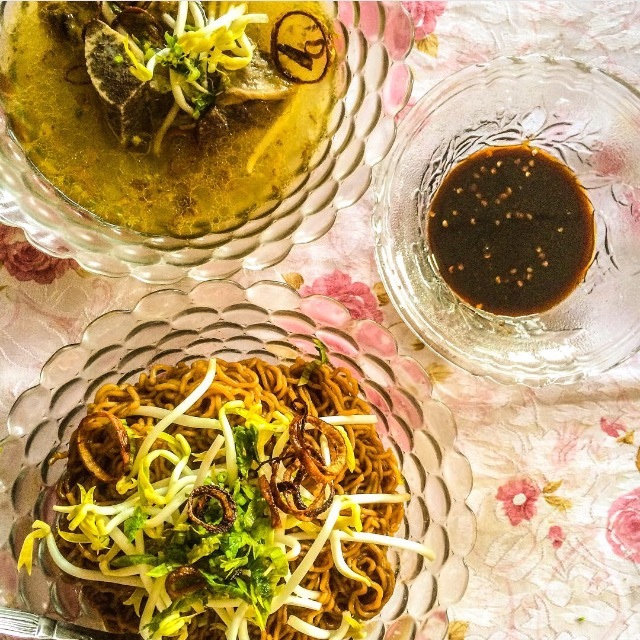 But this time around was different because Dayang's mom made us the real taste of Sarawak Mee Kolok and it was bloody amazing! It was bloody good yall! At night, we went to this Nasi Ayam Penyet place which also had satay. Here's the unique thing about Sarawak satay, they're actually flat but taste wise, it's still good. The next day, it was time for some caving so we went to Fairy Cave. This time around, I actually had the chance to go inside and it was very exciting. It was fun and really beautiful but you sure as hell need some stamina *sigh* as some steps would be really steep. We also went to Wind Cave but unfortunately, the cave was closed as there was something going down so maybe next time. After that, we went to Serikin yeap the Indonesia-Malaysia border for some shopping. Once we're done with our shopping, we decided to go back to Kuching while we made a detour to Tasik Biru, Bau. It felt good to be here again after 10 years. Later that night, we went to Kuching downtown. I had Gula Apong ice-cream. DEFINITELY A MUST TRY and if you don't, it's like you weren't even in Sarawak! That's how good it was and you could only have Gula Apong in Sarawak yall. That's all for now. Stay tune for next part.